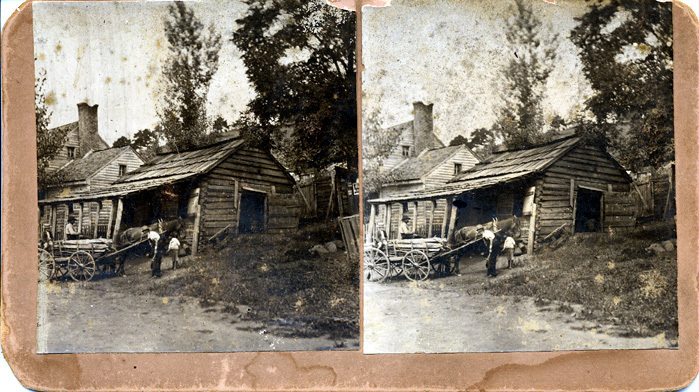 Comments: This Burgess stereograph shows Coleman Ball's Blacksmith Shop at the corner of Ferry and Main Street. The stereograph was an almost identical side-by-side set of images of a single scene, viewed simultaneously through an optical device held to the eyes like a pair of binoculars. Each eye looked at a slightly different image, and the fusion of the two images in the mind creates the illusion of depth. Such stereographs or stereo cards were typically produced between 1845 and 1925 and were often both educational and entertaining parlor fare. Burgess produced many stereo cards of Scottsville scenes.